cruise ships can be seen entering and leaving the city's harbor carrying throngs of vacationers. Once the travelers have explored the shores of Beijing, they return to their boats and eagerly anticipate their next destination. 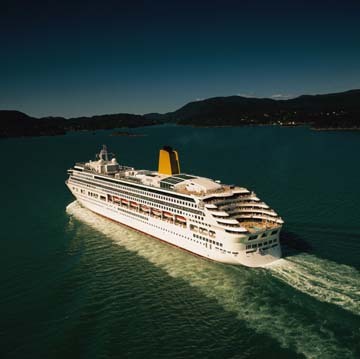 Other stops that Asian Vacation Cruises make throughout the journey include Bangkok and Hong Kong. Forbidden City. The Palace of Earthly Peace was the place where royalty would consummate their marriages. 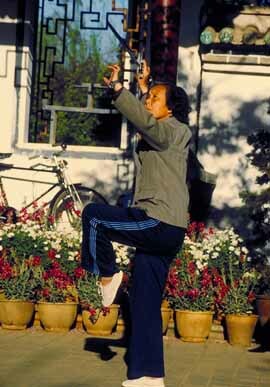 The Hall of Heavenly Purity was only used by the emperor and the Inner Palace was where the Woman Practices Tai Chi in Beijing emperor would conduct daily activities. There is also a Hall of Treasure, a Hall of Ceramics, a Hall of Clocks and a Hall of Bronze Ware in the Forbidden City. Beijing is also famous for its unique style of architecture as well as its breathtakingly beautiful gardens. For hundreds of years the Temple of Heaven has left numerologists, necromancers and engineers absolutely speechless. The bases of the temples are square while the temples themselves are round. This is intended to reflect the ancient Chinese belief that the earth is square and heaven is round. Originally a mansion built for Emperor Yongzheng, it was later used as a lamasery. The lamasery has five ornate halls that contain opulent statues and sculptures. The Summer Palace is an imperial Chinese garden. From the top of Longevity Hill climbers will have a wonderful view of a stone pagoda and the Jade Belt Bridge. Kunming Lake takes up the majority of the park. The Grand View Garden is a more recent addition to Beijing. Built in 1986, it mirrors the garden written about in the novel The Dream of Red Mansion. Tian'anmen Square is located in the heart of Beijing. 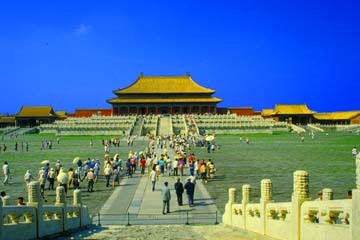 Originally created to be the entry way into the Forbidden City it remains one of the largest city squares in the world. 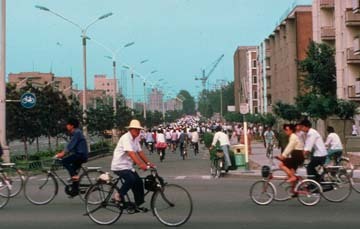 Because of the massacre that occurred here in 1989, the square has become infamous throughout the rest Bicyclists in Beijing of the world. Located in the center of the square is the Monument to the People's Heroes which pays homage to those who lost their lives in the brief revolution. Beijing is a beautiful city that will leave a lasting imprint on any who visit it.